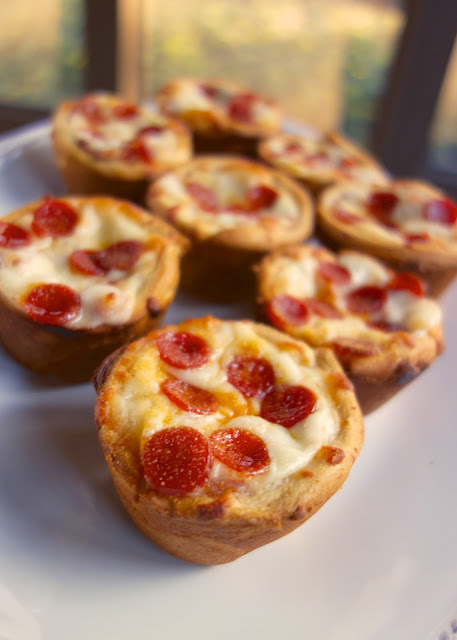 Deep Dish Pizza Cupcakes - make mini deep dish pizzas in your muffin pan! Crescent rolls, pizza sauce, mozzarella cheese. Let the kids customize each pizza with their favorite pizza toppings. Great for tailgating, parties, lunch or dinner. Pizza is my all-time favorite food. I could eat it for breakfast, lunch and dinner. The other day I was in the mood for deep dish pizza. I wanted something quick, so a traditional deep dish pizza was out of the question. 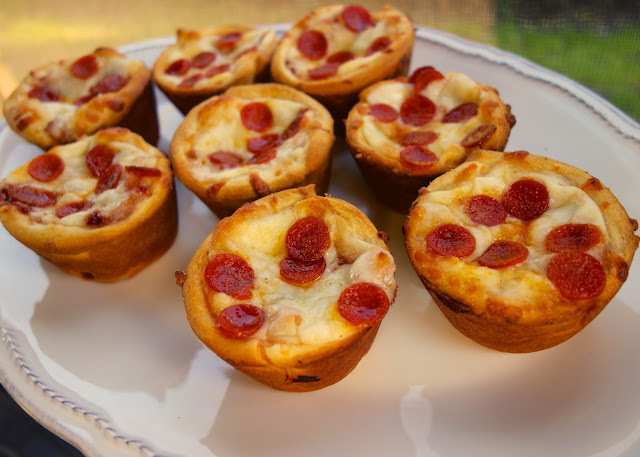 I had a can of crescent rolls in the fridge, so I made these deep dish pizza cupcakes. They were SO good. They took about 20 minutes from start to finish. We had them for lunch, but they would be great for a quick dinner. These can be customized for every family members personal preference. You might want to double the recipe, these don't last long! These are so cute! What a perfect weeknight meal. Great idea and they sound so delicious. If you get a chance stop by my blog. I am having a giveaway for my new cookie cookbook. You have the best crescent roll recipes! This looks so cute and delicious! These are genius...can't wait to make them...I am about to do a post on the many uses of crescent rolls and will put this recipe in, linking back to you. Awesome idea! These look so simple yet way cuter than regular pizza! Too adorable! I'll have to do these the next time Trevor has a friend spend the night. This is a great idea for a party. I am hosting one next week and was wondering about making them and then freezing them? Has anyone tried this? I am a freezer cook and I am pretty sure these will freeze beautifully. You could then microwave them, but I will probably bake them for 10 minutes after they are thawed. Dee - I haven't frozen them. If you do freeze them, make sure to bake them first. They won't rise properly if you freeze them without baking them first. Let us know if you try it! It looks like a good dish to pass at a party!!! does it work if you don't use the garlic powder? looks delicious!! I made these for dinner last night and they were so easy and soooo good. Thanks for sharing. You can even use the low fat crescents, low fat cheese and turkey pepperoni to make it healthier! !thanks for sharing this! Always looking for easy quick recipes and this one is great can add what ever ingredients I have in the house. What are cresent rolls? Live in Australia so are they called something else here? I have never seen them in Australia (from US moved over 4 years ago). I think maybe something like puff pastry could work as a replacement.. But it wouldn't be exactly the same. Could u give me ur cresent roll receipe? I am from india. Do u know what is it called here? I made these tonight and it was a HUGE hit. My 2 year old and 4 year old devoured them. Next time I will double the recipe. You will get 12 pizza cups - Enjoy! Will these work in a mini cupcake pan?